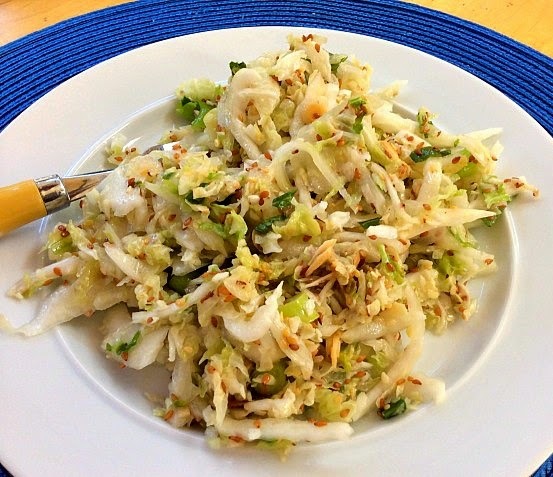 This Asian Cabbage Slaw recipe is made with the rice vinegar, a little honey, agave nectar, sesame seeds, almonds and some seasoning. Aside from a good dressing, I like my vegetables crisp and refreshing and that is why I prefer this coleslaw over the traditional mayo based ones. I find that using rice vinegar blends perfectly with the vegetables to create a really amazing flavor while preserving the texture and moisture content of the cabbage. Toss the shredded cabbage and scallions in a large bowl and stir to mix. Drizzle with the olive oil; enough to coat, but do not drown it. Sprinkle with vinegar, agave nectar, cumin, honey, almonds, sesame seeds, sea salt and pepper, to taste. Toss to coat. Taste test to see if it needs a little more more oil, vinegar, or salt and pepper. Adjust the seasoning. I love Asian salads like these! Yours looks marvelous! Thanks so much and thank you for stopping by! Oh yum, I love simple Asian dishes! So healthy, and delic! Thank you! Have a great weekend and thanks for stopping by! Love the mix of flavours! I will love your Slaw! Hope you have a great week and thanks so much for sharing your awesome recipe with Full Plate Thursday. Your post has been pinned with the party!